On July 16, 1054, Patriarch of Constantinople Michael Cerularius was excommunicated, starting the “Great Schism” that created the two largest denominations in Christianity—the Roman Catholic and Eastern Orthodox faiths. 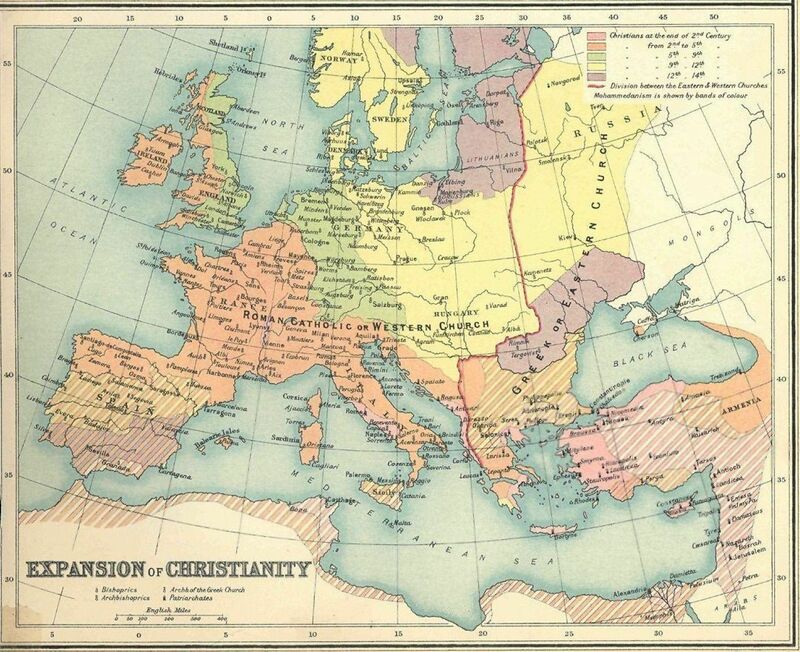 The Great Schism split the main faction of Christianity into two divisions, Roman Catholic and Eastern Orthodox. Today, they remain the two largest denominations of Christianity. On July 16, 1054, Patriarch of Constantinople Michael Cerularius was excommunicated from the Christian church based in Rome, Italy. This excommunication severed the largest faction of Christianity, called Chalcedonian Christianity. The split is known as the Great Schism. The Great Schism divided Chalcedonian Christianity into what are now known as the Roman Catholic and Eastern Orthodox faiths. The Great Schism was both a spiritual and practical conflict. For instance, one of the spiritual differences between the western (Roman) and eastern branches of the church was whether it was acceptable to use unleavened bread for the ceremony of communion. (The west supported the practice, while the east did not.) A more practical conflict that led to the Great Schism was whether the pope, the spiritual leader in Rome, had authority over the patriarchs, religious leaders in the east. The Great Schism was long-lasting; the two branches of Christianity are still split. Catholicism is the single largest Christian denomination, with more than a billion followers around the world. Eastern Orthodoxy is the second-largest Christian denomination, with more than 200 million followers. Eastern Orthodoxy includes national churches such as Greek Orthodox and Russian Orthodox. Christian sacrament commemorating the death of Jesus Christ with bread and wine. branch of a church or larger spiritual faith. loose affiliation of several Christian denominations (including Russian Orthodox, Greek Orthodox, etc.) which follow early church hierarchy. to cut off or expel from a church. group within a larger group. highest-ranking bishop in Eastern Orthodox, Oriental Orthodox, the Catholic Church, and the Assyrian Church of the East. useful or easy to use. to separate or cut away. having to do with baked goods lacking a substance that causes them to expand or rise.